“Next year we are going abroad to somewhere warmer and drier” I was quoted last year when we left Kent following a week of wet weather. Well that didn’t quite work out as I planned! 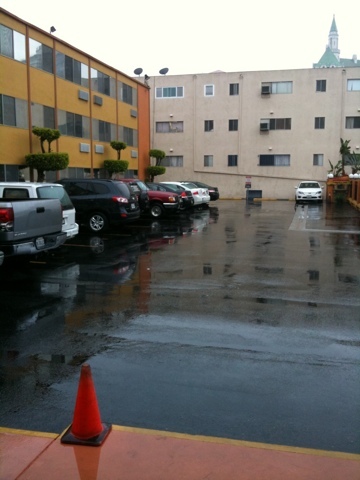 Day three of our Californian adventure and another day awoken by the sounds of rain outside. And heavy rain at that. Apparently the temperatures are around ten degrees lower than seasonal norm for this part of the country. Typical! Luckily the in depth weather forecast that you get in CBS news says it will get better later on in the week. Great. Fortunately we were not exploring today, we were driving so it didn’t affect us too much. We decided to take breakfast at the hotel today as it was included in the price. As expected, the offering was continental…croissants and coffee and orange juice. I took down some of my dried crackers hoping there would have been some butter or jam, but no such luck. I can understand why hotel offer it for free; it’s a token gesture and I guess at the price we paid I shouldn’t expect more. 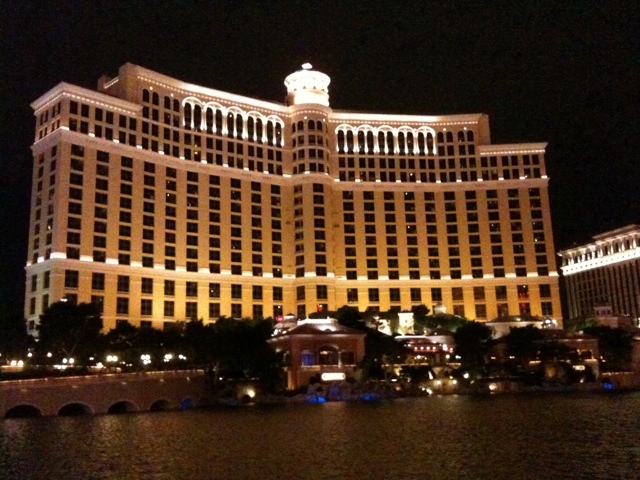 Once we had packed our cases we braved the rain to the car and then set the sat nav for the address of the next hotel, the third of the trip, The Bellagio in Las Vegas. Before leaving Long Beach we topped up the petrol tank, $25 dollars worth, which worked out at around 50p per litre. Well cheap. We then joined the rush hour traffic, which was heavy due to the unusually wet conditions and headed north. Eventually the traffic thinned out as we left the built up areas but the rain continued to fall making driving difficult at times. 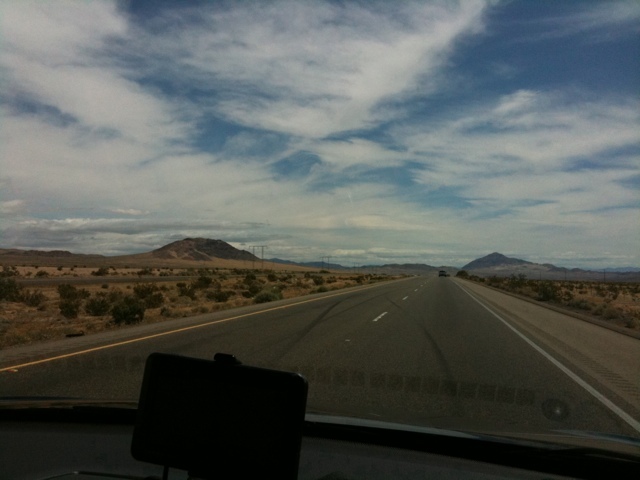 We soon joined the Interstate highway and made good progress, and eventually the rain stopped as we got closer to Nevada. As lunchtime approached we pulled over at Baker, a town approximately 100 miles from Las Vegas, where we re-fuelled and had a light lunch (french fries and soda’s) before continuing on towards the desert city. As we got to the edge of Las Vegas, we started to observe the famous skyline, but rather than heading along the strip, our sat nav lady told us to bypass Vegas and remain on the interstate highway. It turns out I had programmed in the wrong address and it was taking us to another place completely. After pulling the plug from the unit, we then drove by instinct, eventually locating the hotel from the huge sign outside. 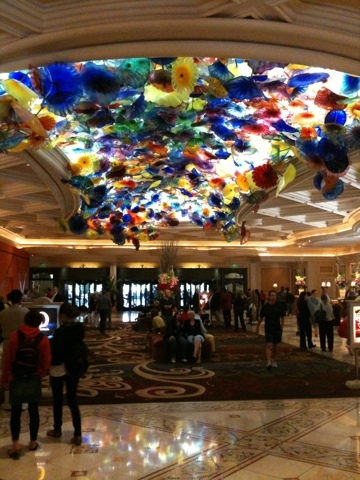 Unless you witness Vegas first hand you cannot comprehend how brazen and brash the place is. From a half size Eiffel Tower, huge buildings, a hotel shaped like a pyramid, it’s all here. We parked our car aside the hotel and went in search of the lobby to check in. As with previous bookings we had made through booking.com, all was in order and we were soon taking our cases to our room. In order to get to the bedrooms you had to walk through part of the casino, an odd experience and not what I was expecting. We took the elevator to the 15th floor and settled in to our new home for the next three nights. The room was very plush, with a huge bathroom and a view overlooking the hotel swimming pools. 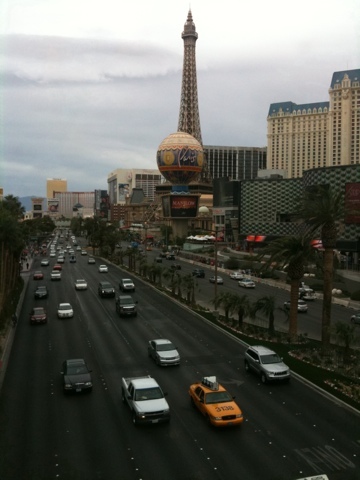 We quickly unpacked and then went on a walk to explore the hotel, the strip and shops. Back to the room for a rest and get ready for a night out on the town, well in our case a meal and a quiet drink somewhere. We walked out of the entrance of the hotel just to catch the end of the fountain show; a spectacular show of water fountains to music. We then searched for somewhere to eat, ending up at Outback Steakhouse, the same Aussie themed restaurant chain as we frequented yesterday in Long Beach. This time I was fully prepared to ask for the gluten free menu and was pleasantly surprised with the choice. I plumped for baby ribs in BBQ sauce. Tina had chicken and we both polished off a bottle of wine between us. On chatting to the waiter about the weather he was pleased it had been cloudy all day and was looking forward to the rain that was expected. We were not! Back to the front of the Bellagio to catch the water show fully before wandering around the casino watching others lose their money. There are hundreds of slot machines, craps and roulette tables and blackjack games, but to be honest I didn’t think it was that crowded, perhaps the recession has affected here too? We soon retired to bed exhausted from another busy day.